The team of Paris, France is top seed in the World Cities Chess Team Championship starting 21st December in Al Ain, United Arab Emirates. Twenty four strong teams shall vie for the Sheikh Zayed Cup and a total of $150,000 in cash prizes at stake in the knock out competition, a first for team tournaments of the World Chess Federation (FIDE). Led by GM Maxime Vachier-Lagrave, the Paris team includes GMs Fressinet Laurent, Edouard Romain and Hamdouchi Hicham with a high average rating of 2677. Teams were ranked by average rating of their 4 highest rated players in the 1st December FIDE rating list. Second seed at 2666 average is the Hoogeveen team of the Netherlands led by GM Anish Giri together with GMs Ivan Sokolov, Sergei Tiviakov and Jan Smeets. The Lviv team of Ukraine is third seed at an average of 2659 with the all-GM squad of Alexander Moiseenko, Yuriy Kryvorucko, Sergey Fedorchuk and Martyn Kravtsiv. Strong challenge is expected from 4th seed Baku, Azerbaijan and 5th seed Saratov, Russia, both with an average rating of 2626, and 6th seed Novi Sad, Serbia in the lead pack of 2600 rated players. GM Nigel Short heads the contingent of London, England while legendary GM Alexander Beliavsky anchors the Ptuj, Slovenia team. Then the Timisoara, Romania team is 9th seed followed by the Athens, Greece team led by GM Hristos Banikas. The Chicago, USA team in 11th seed is spearheaded by GM Varuzhan Akobian followed by the Astana, Kazakhstan team headed by former Asian Indoor Games champion GM Murtas Kazhgaleyev. The next ranked are Lund-Linkoping, Sweden; Riga, Latvia; Tehran, Iran; Tashkent, Uzbekistan; Cairo, Egypt; Manila, Philippines; Istanbul, Turkey; Dhaka, Bangladesh; Wu Xi, China; Al Ain, UAE, Chennai, India; Kampala, Uganda and Canberra, Australia. There shall be four categories of teams. The host city is seeded into the 1st Category quadrant among the top 6 teams. Next 6 teams form the 2nd Category followed by teams 13 to 18 in the 3rd Category and teams 19 to 24 in the 4th Category. At the opening ceremony the night before the round, teams shall be drawn by lot such that there will be teams of four categories shall be in one group. After the Preliminary round robin stage, the top two from each group advance to the next stage, the Round-of-16, together with the four best third place teams. They shall play a knock out match which shall be followed by Quarterfinals, Semifinals and the exciting Final match. Concurrently, an individual open tournament shall be organized, the Al Ain Chess Classic, to which players eliminated from the knock out team competition can join. The $30,000 tournament is open to FIDE rated players. In the unique Al Ain System format, another first in the chess world, players from the knock-out team event carry over their points to the individual Swiss. The Al Ain Chess Classic will be a 9-round combined Swiss Al Ain System wherein players eliminated from the first three stages of the World Cities Team Championship, namely Preliminaries, Round-of-16 and Quarterfinal, join the individual tournament and carry over their points from the team event. 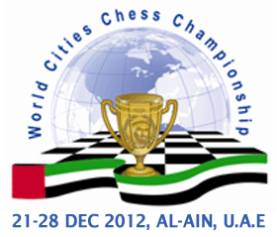 Players will also have a chance to attend a FIDE Trainers Seminar from 22-26 December 2012 at the Al Ain Chess Club. The lecturers will be GM & FST Efstratios Grivas and GM & FST Adrian Mikhalchishin. Visit the FIDE site for details.